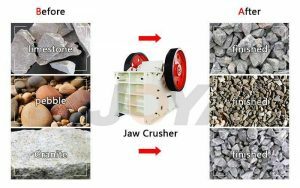 Home > News > Which materials can be selected for the jaw plate of the jaw crusher? Which materials can be selected for the jaw plate of the jaw crusher? Jaw crusher is an indispensable coarse crushing equipment in mine crushing production line, which is usually used for primary crushing of materials. The jaw crusher consists of a working chamber composed of moving jaws and fixed jaws. It is subjected to huge crushing force and friction of materials, and is easy to be worn. In order to protect the jaw plate, wear-resistant lining is installed on the surface of the moving jaw and the fixed jaw. Board, this kind of lining board is also called crushing board. Shanghai Joyal Mining Machinery is a manufacturer of ore crushing processing machinery and equipment, and we talk about this kind of crushing board. What material is commonly used in jaw crusher crushing plates? High manganese steel is the traditional material of the jaw crusher of the jaw crusher. It has good toughness and good deformation hardening ability. The characteristic of high-manganese steel is that the wear resistance is the hardness, and the crushing of the general materials is very advantageous. Whether it is the crushing of the stone or the breaking of the mineral, it is a good equipment. Compared with the medium manganese steel, the high hardness of the high manganese steel is low, and the yield strength is low. Under non-strong impact conditions, the work hardening is insufficient, and it is easy to rheology and cutting. In order to improve the service life of the jaw plate, medium manganese steel was developed. High-chromium cast iron and high-manganese steel are also suitable. Although high-chromium cast iron is an excellent wear-resistant material, it is directly damaged or deformed by a few times due to its poor toughness. Exfoliation occurs. Therefore, the use of high-chromium cast iron as a jaw plate does not necessarily lead to better use. In recent years, high-chromium cast iron has been cast or bonded to high-manganese steel plates to form composite jaws, giving full play to the high wear resistance of high-chromium cast iron and the high toughness of high-manganese steel. Life expectancy has been significantly improved. Medium carbon low alloy cast steel is a widely used wear resistant material, mainly due to its high hardness and proper toughness, which can resist the cutting action of materials and the fatigue peeling caused by repeated extrusion of materials. Shows good wear resistance. At the same time, the medium carbon low alloy cast steel can also be adjusted by the composition and heat treatment process to make the hardness and toughness vary within a wide range to meet the requirements of different working conditions. Previous: How does a fine crusher break sticky material?